"Fourth of July Celebration "
An image scanned from a black and white photograph with the caption, "4th of July." 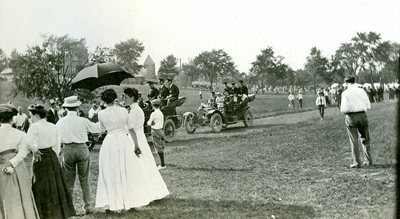 Early automobiles travel in a parade past a row of spectators, some of which are dressed in long white gowns and holding umbrellas to stay out of the sun. A building with a tall tower with a distinctive, angular roof is visible in the background. Saved within an album where other captions refer to "Mt. Hermon," but the exact location isn't identified. Compiled by a member of the Wyman and Woodsum families of West Peru, Maine.